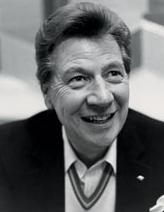 Water Rat Max Bygraves was born in Rotherhithe, South London. He grew up in a two-bedroom Council flat with his five siblings, his parents and a grandparent. His father was a professional flyweight boxer, known as Battling Tom Smith, and a casual dockworker in the London Docks. 'Wally' left school at 14 and went to the Savoy Hotel to work as a pageboy but his services were dispensed with because he was too tall. He then became a messenger for an advertising agency. This was followed during World War II when he worked in the R.A.F. as a fitter. It was during these early performances that he changed he changed from 'Wally' to 'Max' Bygraves, in honour of his great hero Max Miller. In his early teens Max supplemented the family income by repairing footwear, and went into business on his own account during summer holidays an early indication of his acute business sense. A good example of his business acumen was when Lionel Bart was in need of money, which he nearly always was, Max bought the rights to his show 'Oliver' for ?350; having reaped his reward from this purchase he eventually sold the rights for $250,000. His main career took off after Jack Payne engaged him for a spot in his new show 'For The Fun of It', with Donald Peers and a young Frankie Howard. In 1950 he was hired to replace Ted Ray at the London Palladium, a role he filled so successfully that he was back again a few weeks later appearing with Abbott and Costello. The London Palladium became his second home for many years. Max made the first of his 19 Royal Variety Performance appearances in November 1950. Among the numerous high spots in his career he worked with Judy Garland in the London Palladium and the Palace, New York which prompted Marlene Dietrich to praise his work highly. Possibly the best remembered show in which he appeared was as the teacher of Archie Andrews in the Radio series 'Educating Archie'. The show also 'launched' the careers of many other such as Tony Hancock and the 14 year-old Julie Andrews, who was ousted from her singing spot when Max joined. Max married Gladys (Blossom) Murray in 1942. They had three children, Christine, Anthony and Maxine. Max also had three other children from extramarital affairs, John Rice, Beverly Mayhew-Sass and Stephen Rose. Max & Blossom were married for 67 years. She died last year (2011). Max was awarded the OBE in 1982.